H. Michael Marquardt, The Joseph Smith Revelations: Text & Commentary, Signature Books, Salt Lake City, Utah, 1999, 410 pages, ISBN 1-56085-126-0. Most of us want to know from whence we’ve come. There is stability, a sense of groundedness, in discovering and acknowledging our roots. To sever our connection with history is in some degree to sever our connection with reality. The same holds true in the religious realm. God does not change in character or nature, thus His constancy woos our trust, His reliability under girds our faith. Revelations which come from God, then, necessarily reflect His unchangeableness. They too are constant, unchanging and uncontradictory. This is why, throughout the history of Christianity, followers of Jesus Christ have valued the earliest known manuscripts, and sought to keep current translations of God’s Word as close to the original revelations as possible. "So, by studying the original revelations we discover that "Urim and Thummim" is a later addition to the text whose retroactive insertion gives the appearance that Joseph used a biblical means to translate the Book of Mormon, ... In reality Joseph placed a magical seer stone into his hat — a process that much more resembled pagan divination." Latter-day Saint faith is also based on revelations which Joseph Smith claimed he got from God. These revelations, recorded less than 200 years ago, are the foundation for the unique aspects and teachings of Mormon religion. In his book The Joseph Smith Revelations: Text & Commentary, H. Michael Marquardt examines the earliest manuscripts of Joseph Smith’s revelations, reaching back into history to preserve the revelations in their original form. In so doing, he returns to the very roots of the Mormon Church, re-establishing ties to a past history of Mormon religion long-lost to some, and never known by others. 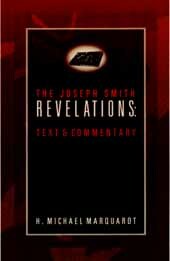 The JS Revelations is an exceptional tool, for it supplies the text of the original manuscripts of Joseph’s revelations, coupled with the current version of those same revelations. Marquardt carefully details what changes have been made to the revelations, where they occur in the text, and, in so far as is possible, when the changes were introduced. As Joseph Smith revised and republished his revelations, these changes were noted by others both inside and outside the Mormon community. Marquardt includes the reactions of these people in a commentary section included with each revelation, and adds his own understanding of the context and significance of the changes. "They change and reverse the original meaning: as if God had commanded Joseph to pretend to no other gift but to translate the Book of Mormon, that he would ‘grant [unto] him no other gift,’ and then afterwards God had changed his mind and concluded to grant him another gift" (David Whitmer, An Address to All Believer’s in Christ, p. 57, emphasis in original). and now behold this shall ye say unto him, He who spake unto you said unto you, I the Lord am God, and I have given these things unto him you, my servant Joseph Smith, jr., and have commanded him you that he you shall stand as a witness of these things, and nevertheless I have caused him you that he you should enter into a covenant with me that he you should not show them except to those persons to whom I commanded him you; and he hath you have no power over them except I grant it unto him you. To summarize, Joseph Smith was commanded to translate the book or plates, which would be his only work, as indeed the project consumed most of his time for the next several months. The revelation indicated that Smith should pretend to no other gift/work, as he would not receive another. But after Smith completed the Book of Mormon dictation and had it published, he started to revise the Bible without any knowledge of Hebrew or Greek, which would be considered another gift. When he revised the ending of Genesis in 1832, he included material from the Book of Mormon which has been assumed to refer to himself: "he shall do none other work, save the which which I shall command him," but dropped the words "none other" for the new text to read, "and he shall do whatsoever work I shall command him." The change in the March 1829 revelation appears to have been made to eliminate problems with Smith’s later involvement with the Bible revision. Since the Bible revision was still in manuscript form in 1835, three of the additions made sure that no work would be excluded from Smith. The textual additions changed the meaning of the revelation’s original 1829 intent (Marquardt, p. 30). Marquardt carefully works through Smith’s revelations, dividing them into chronological segments of LDS church history. Not all revelations underwent extensive revisions, some remained basically unchanged. But at times even some relatively small changes yield great insight into the development of Mormon doctrine and terminology. As various LDS and non-LDS historians indicate, Joseph Smith, Oliver Cowdery and other church leaders added terms and concepts to the evolving rituals and theology of early Mormonism (eg. Bushman, VanWagonner, Marquardt, Quinn). On several occasions, these were added retroactively into older revelations. This gave the appearance that the newer concepts were a part of divinely-given revelation and had been a part of church doctrine all along. Marquardt’s analysis and commentary highlight a number of these retroactive insertions, helping the reader obtain fuller understanding of when and how Mormon doctrine developed. Now, behold I say unto you, that because you delivered up so many writings, which you had power to translate, into the hands of a wicked man, you have lost them, and you have also lost your gift at the same time (BC 9). Now, behold I say unto you, that because you delivered up so many those writings, which you had power given unto you to translate, by means of the Urim and Thummim, into the hands of a wicked man, you have lost them, and you have also lost your gift at the same time, and your mind became darkened; (D&C 36; cf. LDS D&C 10:1-2; RLDS D&C 3:1). In the Evening and the Morning Star, January 1833, is a brief tentative allusion to two biblical objects, Teraphim and Urim and Thummim: "It [the Book of Mormon] was translated by the gift and power of God, by an unlearned man, through the aid of a pair of Interpreters, or spectacles — (known, perhaps, in ancient days as Teraphim, or Urim and Thummim) [.]" Teraphim, it should be noted, were probably some sort of figurines or statues representing the image of idols. Worship of the Teraphim was forbidden by the ten commandments. When mentioned in Israelite context, they are almost always condemned. Teraphim were used for divination by opening up the liver and examining it. It would be an odd quirk of historical fate for someone to suggest that the Teraphim would be used as a means for translating the Book of Mormon. One also wonders if the writer of the Evening and the Morning Star article knew the nature of the biblical Urim and Thummim. There is no evidence that these were used for translation, as the term is presently understood. They were to obtain answers to specific questions which could be answered with a simple yes or no. That "Urim and Thummim" was an addition to the text is evident since it was a development in early church history and culminated in its inclusion in the 1835 D&C. Primary sources tell us that a seer stone was used in the translation process" (p. 51-52). So, by studying the original revelations we discover that "Urim and Thummim" is a later addition to the text whose retroactive insertion gives the appearance that Joseph used a biblical means to translate the Book of Mormon, and that this means was known since 1829, before the Mormon church was organized. In reality Joseph placed a magical seer stone into his hat — a process that much more resembled pagan divination. For more on the eyewitness testimony related to Joseph’s method of producing the Book of Mormon see "Translation or Divination." BC 24 dated June 1830 — 1835 D&C 2; cf. LDS D&C 20; RLDS D&C 17 (pp. 62-68). This deals with the Articles and Covenants of the Church of Christ, the name under which the LDS church was originally organized. The church had undergone changes in organizational structure and had added new callings which were then inserted into the original revelation. BC 28 dated Sept. 1830 — 1835 D&C 50; cf. LDS D&C 27; RLDS D&C 26 (pp. 72-80). This short revelation originally dated to 1830, more than doubled in length when republished in 1835, and included references to many of the newer theological developments being taught by Cowdery and Smith. By 1835 the concepts of Aaronic and Melchizedek priesthoods had been introduced into LDS church structure as part of its ongoing development and growth. These did not come as a result of divine or revelatory intervention, but as the natural outgrowth of thoughts and ideas within the Mormon leadership. The 1835 textual additions to this revelation changed all that by introducing the story of John the Baptist ordaining Joseph and Oliver into the Aaronic priesthood, and Peter, James and John ordaining Joseph and Oliver into the Melchizedek priesthood, confirming them as apostles. Once again a retroactive insertion of new material into an old revelation gives the false appearance that these concepts originated in supernatural events that took place before the Mormon church was organized. Marquardt states, "This 1835 addition is the earliest known record of Christ’s apostles being sent to visit Joseph Smith and Oliver Cowdery" (p. 80). From the above it appears that changing conditions in the church brought about a gradual development in the handling of funds. But rather than seek a new revelation, the old one was reinterpreted. …Deletions from the text for whatever reason are more serious than additions and are more difficult to understand, especially when manuscript evidence agrees that there was text present. The deleted items were originally part of the laws of the church (pp. 113, 115). Kirtland Revelation Book dated Sept. 22-23, 1832 — 1835 D&C 4; cf. LDS D&C 84; RLDS D&C 83 (pp. 212-219) Marquardt considers this, "one of the most interesting texts in Joseph Smith’s revelations" (p. 217-218). It originally taught that not only was John the Baptist filled with the Holy Ghost from his mother’s womb (as the Bible teaches) but that "he was baptized while he was yet in the womb and was ordained by the Angel of God at the time he was eight days old" (p. 213). Joseph would later alter this revelation to read that John was baptized "while he was yet in his childhood" (p. 217) but this in turn has created interpretive problems for it has John receiving ordination prior to baptism. Marquardt has done a thorough and precise study. His format makes it easy to identify the changes and compare the original to later revisions. His commentary sets forth historical facts, and introduces contemporary reactions to the changes that are germane. He avoid polemics and does not pretend to read Joseph’s mind and motives, but instead carefully puts both the original revelations and the revisions into a well-documented historical context. It is this objective, well-organized approach, so characteristic of Marquardt’s work, that allows the reader to discern the pattern that emerges: Joseph Smith provides a revelation which purports to be directly from God, with God himself issuing the commands in first person; as time passes, circumstances and events in Joseph’s life, or actions he takes, negate or invalidate part or all of the previously given revelation; Joseph then revises the revelation, altering the meaning and thus resolving the conflict; and, finally, the revised revelation is republished under the original date and context, thus giving the appearance that this is how they originally came from God. The revelations originally came from God, but Joseph failed to obey them and later took the liberty to revise them as he saw fit to either cover-up his disobedience, or make them conform to his developing religious ideas. This was the perception of some early Mormon leaders like David Whitmer who was quoted earlier. The conclusion is that Joseph began as a true prophet of God, but upon revising the revelations and teaching unbiblical concepts like the plurality of Gods and polygamy, Joseph became a fallen and false prophet. The revelations did not originally come from God, as Joseph claimed, but were Joseph’s inventions. Since they were his to begin with, Joseph saw no problem making revisions as he deemed necessary. This is the perception of those who check the prophetic "fruit" of Joseph’s life and find deception, altered revelations, false prophecy and unbiblical teaching. Joseph thought the revelations were from God, and saw no problem with God changing or altering the revelations as circumstances demanded. This is likely the perception of many Latter-day Saints who are aware of the altered revelations. The difficulty of such a view is that Joseph’s God could not then be considered the God of the Bible, but rather a false, counterfeit God of Joseph’s own making. None of the above are attractive alternatives if there is any hope of sustaining Joseph as a true prophet of God. Perhaps this is why there has been no move on the part of LDS leadership to identify or explain these changes. Nonetheless, lifelong members, new converts and investigators now have an invaluable tool with which to dig down to the true roots of the Mormon Church. Marquardt’s The Joseph Smith Revelations, allows us to reconnect to true history and in so doing reconnect to reality.